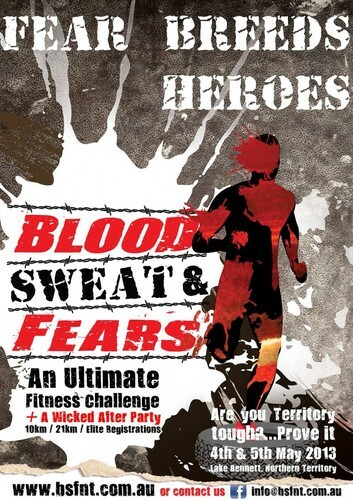 Blood Sweat & Fears is a 10km and half marathon ultimate fitness challenge and the scattered obstacles you will encounter are designed to test both physical and mental limitations. In the words of Bill Cosby “In order to succeed, your desire for success should be greater than your fear of failure” only those that are true to themselves will get through when their body fatigues…the mentally strong will finish intact and for those needing extra motivation a cold crisp Hahn Super Dry is waiting at the finish line…so hurry up! In a nutshell after completing Hahn SuperDry Blood, Sweat & Fears you will be undoubtedly left with an adrenalin rush and a sense of accomplishment that can only be achieved from pushing yourself beyond your known boundaries. The inaugural Hahn SuperDry Blood, Sweat & Fears is set to take place on 4th & 5th of May at Lake Bennett, the location is sure to set Hahn SuperDry Blood, Sweat & Fears apart from all the other obstacle marathons being run in Australia the Northern Territory bush in conjunction with the harsh climate will make this the Ultimate Fitness Challenge. First wave of competitors will launch their attack on the course on Saturday from 0730, the Elite Competitors will be starting on Sunday at 0800. When registering you will be asked to select your preferred start time. It is recommended you be on the course 90min prior to allow enough time to collect your pack, information and bibs numbers. Stick around and celebrate your success, compare bruises and have a few Hahn Superdry’s with other Hahn SuperDry BSF competitors at the Hahn SuperDry BSF Exclusive After Party. With both local and interstate artists taking the stage from 4pm you will have no problem laying back end enjoying arvo with good sounds, people and ice cold drinks. Later into the night we will crank it up a notch for all Hahn SuperDry BSF competitors to dance the night away and fill their boots. The Hahn SuperDry BSF After Party finishes at midnight and BSF encourages participants and spectators to stay and camp if they do not have a sober driver.